Our talks, feeds and diver sessions are great fun and allow you to really interact, engage and understand our Aquarium. We offer a wide variety of talks and feeds daily. Please note; this is an example talks and feeds schedule and amendments can occur on the day of your visit. *Please note: This is an example talks and feeds schedule. Our schedule changes daily. On arrival you will receive a copy of the talks and feeds schedule for the day of your visit. Here you will have the opportunity to have a hands on encounter with either our bearded dragon or one of our snakes while a member of staff gives you an insight into the amazing lives of reptiles. At our seal feed you will get to see our aquarists exercise the seals and give them tasty rewards as they roll, swim and jump around our seal pool. Join a member of our vs team in our underwater tunnel, where you will learn all about the many fish, sharks and invertebrates we have in our largest exhibition. The longest underwater safari in Europe. Come along ask us as many questions as you like! We love questions! Here you will have the opportunity to have a hands on encounter with our starfish while a member of staff gives you an insight into the amazing marine life in Scottish rock pools. Join us in our underwater tunnel to see either our scatter feed where we feed our fish, or for a diver feed where divers feed some of our bottom feeders such as our rays and cat sharks. A very insightful feed and not to be missed if you are a sea life lover! Head for an adventure and join a member of the vs team in our swamp section where you will learn all about our rainforest animals such as piranhas and our alligator snapping turtle and many more. Here you will have the opportunity to have an hands on encounter with either our millipedes or one of our stick insects while a member of staff gives you an insight into invertebrates. Interactive session, suitable for all ages! Here you will have the chance to see one of our fascinating and unique feeding shows, where you can see an array of animals fed daily. 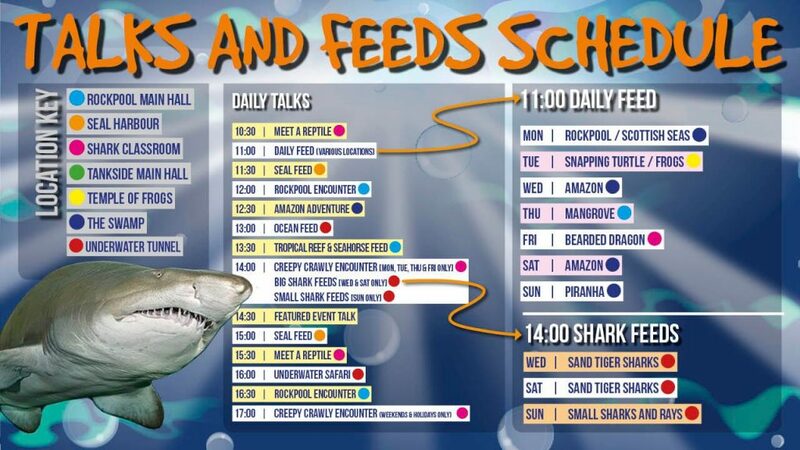 Come and see our vast array of sharks fed every Wednesday and Saturday. Check your daily talks and feeds schedule when visiting. A feed not to be missed. We suggest heading down to the tunnel 5-10 minutes early to secure a prime location for viewing the feed. This is a very popular feed, and one not to be missed.